Short summary: Colie is sent to stay with her aunt Mira in Colby, North Carolina. She’s not happy about it, but she doesn’t have a choice. Colie has never fit in, first because she was fat, then because she had a false reputation. She’s not expecting to make many friends there, after all, if no one likes her at home, why should they like her in Colby? But Colby ends up surprising her. She quickly meets Norman, the weird art boy, who lives with Mira. Norman helps her get a job at the Last Chance Bar and Grill, where she meets fellow waitresses, Morgan and Isabel. These two girls manage to teach Colie what friendship means, and how to appreciate Colie for who she is. In public or under the covers? It is totally fine to read this book in public. There are a couple of make-out scenes, but it’s totally fine if you want to read this in front of your mom. What mood? This book is an emotional journey. You will feel several different emotions throughout reading this book. Main character – yay or nay? I would be besties with Colie. I found that I could really relate to Colie. She’s one of my favorite Sarah Dessen characters. Crust factor: Colie’s false reputation is pretty crusty. Don’t judge a book by its cover: I love the cover. It makes me think of summer. 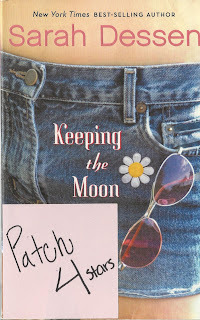 This is probably one of my favorite Sarah Dessen book covers. Overall Rating: I give this book an Alexander Skarsgard (4 out of 5 stars) because while it is amazing, there were a couple what the heck moments. Thank you so much =] We appreciate it!